Astronomy has come a long way in the 405 years since Galileo's historic first survey of the night sky over Florence in 1609. The next generation of terrestrial telescopes are set to peer deeper into the cosmos and further back in time than ever before. We sat down with Dr. Patrick McCarthy, Director of the Giant Magellan Telescope Organization, to find out just how far the field has advanced and where it might be headed. McCarthy: Optics, as we're familiar with them, began in part because the people of Venice who were building on the technology of traditional Roman glass making—all ancient glasses were opaque, deeply colored, you couldn't see through it—but on the island of Milano, they first learned how to make glass that was transparent. And once you have transparent glass with any kind of curvature to it, you can immediately see that it magnifies light and distorts images. That led to the invention of lenses and spectacles, but it wasn't until a glassmaker in Holland by the name of Lippershey was preparing two lenses and lined them up—one at arms length, the other just in front of his nose—and realized that they made distant objects appear much bigger. He and others began mounting these lenses in pairs to make telescopes. In 1609, Galileo built his own telescope and has the inspiration to not point it at distant trees and buildings but up to the heavens. It was pretty audacious to point a telescope up at a star in those days and think you might see something but he quickly changed the whole world and the whole history of science by realizing that the universe was a very different place than we thought. So by taking a piece of technology and repurposing it for a new task, he changed the history of the world. And that was really the first step in the path of building telescopes and its been that same approach in the four centuries since. Gizmodo: And so where does this path lead? McCarthy: It's funny because every generation, when people build the newest "biggest telescope", they end up saying "we'll never build one bigger than this. This is the end of the line of the technology, we'll never be able to top this." And, of course, someone from the next generation of young people come along, and they find a new way forward. So in the history of telescopes like Galileo's, they learned to make telescopes that were larger. they quickly found out that a limitation to the simple lense—that is, a single piece of glass—was that they make images in different places in different colors. So if you look through a simple lense and you look at a star, or just a lamp post, you see a spread of color [the halo effect - ed.] that makes it very difficult to take sharp images. And it was because of this that people figured out how to make pairs of lenses out of different types of glass that cancel out the chromatic aberration. If you buy a camera lense today, it might have five or six different lenses, each with different types of glass, and they're all there to ensure that all wavelengths of color come into focus at the same point. That was a major breakthrough, figuring out how to make lenses that were achromatic, and that led to a huge growth in refracting telescopes—those based on lenses—but around 1860 or so it became evident that lenses of a certain size, those bigger than about a meter (36 - 40 inches) in diameter, tend to sag and break under their own weight. That was really the end of the line of that technology. But not long after Galileo, Isaac Newton—who was also a pretty smart guy—realized that you can bend light in reflections as well as in transmissions. So you made a telescope based on mirrors rather than lenses. But that avenue of Astronomy technology sat dormant for centuries, but as people saw the limitations of lense-based telescopes, they began to build them with mirrors instead. Around 1890 was the crossover, where bigger telescopes were made from reflecting surfaces rather than lenses but a big issue with reflecting telescopes is that when you polish a piece of metal, it tends to oxidize and tarnish. So people were looking around ofr a type of metal that was shiny, pretty strong, and inexpensive and they came up with an alloy called speculum metal—its an alloy of brass, tin and copper. you can polish it but it tarnishes in just a few days so astronomers at the time had to re polish their mirrors every two or three days which was very hard work. The next breakthrough came when someone decided to take the best of both worlds, combining the glass used for lenses and mounting reflective metal on top of the glass. You would grind the glass into the shape of a mirror and then deposit a surface of silver on top of it. That way you get all the control and the properties of glass but made shiny like a mirror. That really set us on the path towards modern astronomy—all astronomical telescopes since the mid-19th century have been metal-on-glass. This led to another period of rapid growth around 1800, especially here in Southern California at Mt Wilson with the first 40, 60 and 100 inch telescopes, and the 200-incher at Mt Palomar. But eventually we again hit the limit of what the technology can do. Glass mirrors couldn't be made bigger than about 8 meters in diameter or else, like the earlier lenses, they would distort and break under their own weight. So people realized that if you want to make a really big telescope, you'd have to combine multiple mirrors into a single focal surface. That turned out to be a technical challenge, but was solved first with the Keck telescope in the 1990s and we're now doing it with the GMT, using a small number of very large mirrors—much like Newton's—and we're now building the James Webb space telescope which uses the same kind of technology as well (but using metal on beryllium to make "single-lightwave" mirrors), which we call a segmented mirror telescope. 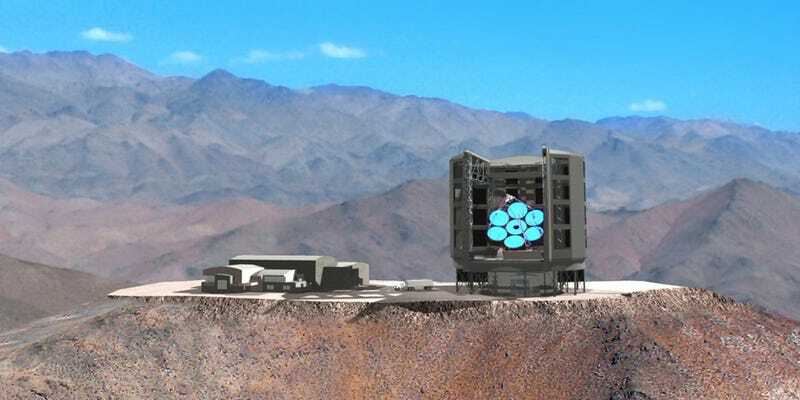 The thinking now is that there really is no limit on how big you can make a segmented mirror telescope so long as you have the room to put it into a support structure, so we're in this fascinating period of technology now that has no obvious bounds. There are financial challenges, engineering challenges but we think we've found a sweet spot with the GMT where we can make a mirror that's 10 times larger than any mirror to date with three times the angular resolution as the Hubble space telescope. And like galileo who used his lenses to examine Jupiter's moons, we'll use the GMT to image planets orbiting other stars. so we'll look at stars nearbgy our solar system, 10s of light years away, to see the planets that orbit those stars. Do they look like our solar system? And our solar system is really very simple—Jupiter has most of the mass of the solar system—in terms of planets—and then a bunch of rocky planets like Mars, Venus, and Earth inside Jupiter's orbit and a few snowballs on the outer edge of the solar system. But we have suspicions that solar systems outside our own may have planets the mass of jupiter but with the orbit of mercury. So there's a whole universe of solar system configurations that we know very little about. GMT and other similar telescopes will allow us to look at them—much like Galileo but with modern instrumentation to actually see the structure of the planets themselves. And that's what we've been waiting for: to see other worlds and answer the question, "Are we special, are we alone? Or are we just commonplace among the galaxies and the universe is filled with planets and filled with life?" If I had to bet, I'd bet on the latter but I'd be that life is much more diverse than we suspect because the planetary systems are much more diverse than our own solar system. We will be able to use the GMT, the Hubble, and the James Webb to look so far out into space that, due to the finite speed of light that we will look back in time. So if we look back far enough we can see the universe in its very infant stages—we should be able to see the first galaxies that formed, perhaps even the first stars so the telescope is in a very real sense a time machine and the GMT will allow us to look back to the very early days of the universe, just shortly after the big bang when the universe as we know it came into being, and that's a pretty profound thing to do. Gizmodo: Given that telescope technology doesn't have a theoretical limit, only engineering and financial as you mentioned earlier, do you feel the future of deep space imaging will be primarily terrestrial, space-based, or a combination of the two? McCarthy: I hope we'll continue to see a balances of the two. While the Hubble has been spectacularly successful, without the big telescopes on the ground taking the spectra, measuring chemical abundances—all the really core astrophysics aspects. One of the biggest challenges to space-based telescopes is that they're extraordinarily expensive and there's a severe limit on the amount of mass that you can effectively lift into orbit. It costs between 500 and 1000 times as much to build a telescope in space as it does to build one on the ground of the same size. Adaptive optics is a game changer. It allows us to achieve space-like resolution on the ground. So what we see is an increasing divergence between space telescopes and terrestrial ones. Large ground telescopes like the GMT are approaching 30 meters while space telescopes are barely breaking 6 meters—there's a crazy gap between ground and space. We'll likely see future space telescopes utilized only for the stuff we absolutely can't image from the ground—primarily because the Earth's atmosphere appears opaque in the Ultraviolet, some parts of the infrared, and just unbearably bright in the thermal range. So if you're trying to image at a wavelength of 100 microns from a ground telescope, you'll see the sky glowing, the ground glowing, everything's bright. But if you put that telescope in space and cool it down and its imaging capability is unmatched; so its a matter of how you balance the technology. I foreseen visible and near infrared from the ground and thermal infrared and ultraviolet from space. Gizmodo: When the GMT does begin to produce data, what will be done with it? McCarthy: The GMT itself will be be made available to scientists based on a peer-review process. There will be a call for proposals, these proposals will be reviewed by other astronomers and the most promising proposals will be given time on the telescope. Those researchers will go to Chile, do their time on the telescope, publishing their findings in the open and scientific literature but at the same time all their data goes into a scientific archive where it is preserved, organized, and curated. Anyone can use that data for their own scientific purposes. Gizmodo: And how much data do you expect to produce? McCarthy: Our data rates are actually pretty modest— it's primarily because we're looking at things that are very faint and very far away. We'll look at the same object for hours at a time so we'll only produce between 10 and 20 gigabytes a night, maybe 30 to 40 terabytes a year. In terms of big data, it's not really a driver, more for the quality and uniqueness of the data. Other facilities that are all about surveying large areas of the sky in a short period of time, they will produce petabytes a year but if you want to find those special objects, you just can't do it at any other sort of facility.